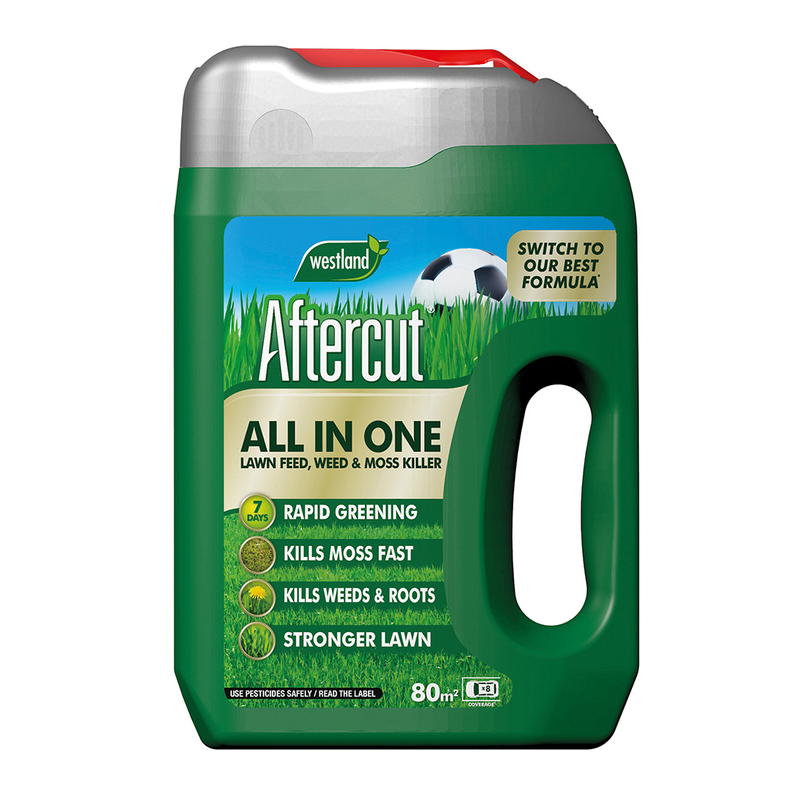 Aftercut All In One contains Lawn Feed that will give your grass a boost in nutrients. It helps grass to rapidly become greener in 7 days and creates a stronger, healthier lawn, meaning that you have to mow less! Aftercut All In One helps to establish a better root system and builds stress resistance. It kills 12 of the most common types of weeds. Not only that, it will kill the roots of the weeds fast so weeds do not return. Are you left with bare patches after use Aftercut All In One? If your lawn has suffered from a high infestation of weeds and moss, your lawn may be thin or has been left with bare patches since using Aftercut All In One. Don’t worry if you have been left with small bare patches as this can easily be repaired with lawn seed. We recommend using Gro-Sure Smart Patch spreader. Smart Patch has a unique blend of ingredients that is designed to repair any patch in any lawn. Its smart Aqua Gel Coated Seed making it guaranteed to grow (when pack instructions are followed). Is your Lawn looking a bit thin? If your lawn is looking a bit thin and bare after using All In One, you may want to thicken your lawn or grow new grass. To sow new grass seed use either Gro-Sure Smart Seed or Gro-Sure Smart Fast Start. These products contain a blend of quick growing, hard wearing lawn seed varieties that are ideal for over-seeding worn grass or filling in bare patches. Aftercut Lawn Thickener is great for thickening your lawn and also releases feed gradually for a consistently thick, green and strong lawn. Switch to our best ever Aftercut All In One formula today. Give your lawn some TLC and benefit from the enjoyment of having a lush, green lawn throughout the warm summer.